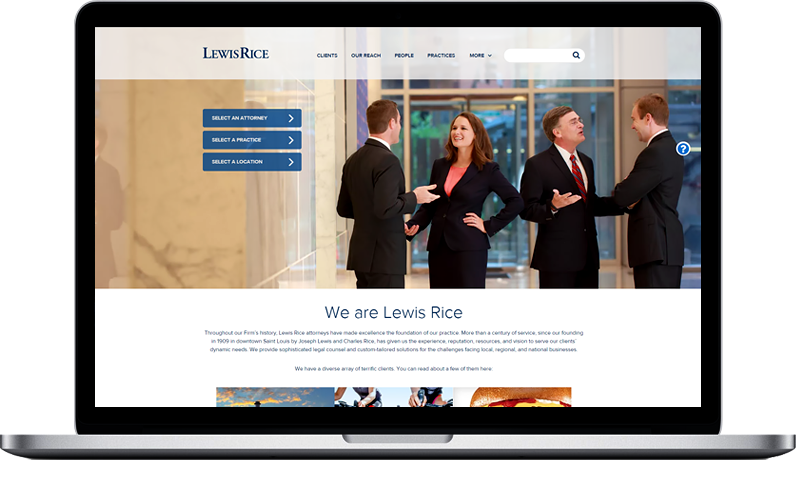 Lewis Rice, a law firm with more than 150 attorneys and over 100 years of history, launched a bold new website today. The Lewis Rice site also utilizes Attorney Microsites—a unique approach to lawyer bios that Great Jakes pioneered. Attorney microsites are, essentially, small websites for each attorney that fit within the firm’s larger website. Attorney microsites can be customized to the specific business development needs of each attorney and contain any number of pages or type of content. An attorney's microsite can be configured to display podcasts, video, PowerPoint presentations, and twitter and blog feeds, as well as "custom pages" to highlight a specific aspect of an attorney's practice. Some notable examples of attorney microsites on the Lewis Rice website include Kirk Damman, Winthrop Reed and Mark Winings. The website was built with Great Jakes’ unique Rainmaker CMS technology. Photos were art directed by Great Jakes and shot by acclaimed photographer Peter Olson.